While gold is good, rare coins do an even better job of preserving and growing wealth. Blanchard, through its subsidiary AG Finance LLC, has created a way for you to put the money you have invested in gold to work for you, by using your gold as collateral on a loan that will help you further diversify into rare coins. The ability to buy gold and rare coins using your purchases as primary collateral. Through our wholly-owned subsidiary, AG Finance, LLC, we provide loans or lines of credit to owners and buyers of precious metals and rare coins. For example, you can pledge $100,000 in gold to buy $70,000 worth of rare coins and still own your gold! 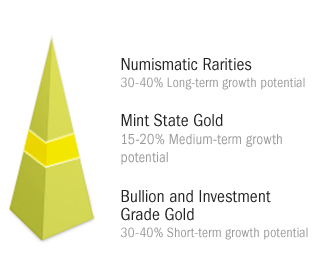 This represents a significant improvement in your liquidity for your gold assets and further diversifies and improves your portfolio. AG Finance Corporation, LLC (AG) was organized as a financial service company with the ability to loan money to clients who want to purchase rare coins while using their precious metals as collateral. AG is affiliated with Blanchard and Company, Inc. (BCI), the leading rare coin and precious metals retailer in the United States. AG provides BCI’s clients with convenient access to low cost financing, available lines of credit and insured storage facilities. AG’s strategic affiliation with BCI will be the catalyst to capture the greatest share of the rare coin and bullion related financing and storage market. The AG/BCI affiliation will provide the unique professional combination of marketing, stable funding and a depository. It is the mission of AG to profitably provide liquidity for precious metals investors who want to use their precious metals as collateral in order to purchase rare coins. In doing so, AG believes that it is providing a financial service to BCI and to bullion investors and expects that it will stimulate further investment in rare coin assets for existing and new clients of BCI. AG offers loans to individuals or companies who wish to finance Rare Coin purchases using precious metals as collateral. STORAGE: Precious metals and rare coins used as collateral will be stored and fully insured. When the executed Collateral Note and signed Loan or Loan Commitment Application are received from Borrower, they are to be reviewed for completeness by an AG Loan Representative. Upon receipt of collateral, BCI will confirm its contents and value the collateral. Fifteen (15) days prior to any payment due date, AG will issue a Billing Summary. Amounts will be due at month-end. After funds are advanced on a loan, collateral value of precious metals plus the rare coin(s) shall not fall below 30% above the outstanding loan amount.